Automatic number plate recognition (ANPR) is a type of surveillance method which uses optical character recognition technology to read the license plates on vehicles. ANPR systems comprises of hardware such as camera, frame gabber and other related equipment as well as software modules. ANPR systems can be used with existing closed-circuit television or road-rule enforcement cameras. The automatic number plate recognition systems identify the number plate on the vehicle, recognize the characters, convert them into digital data and store the license plate number in a database. 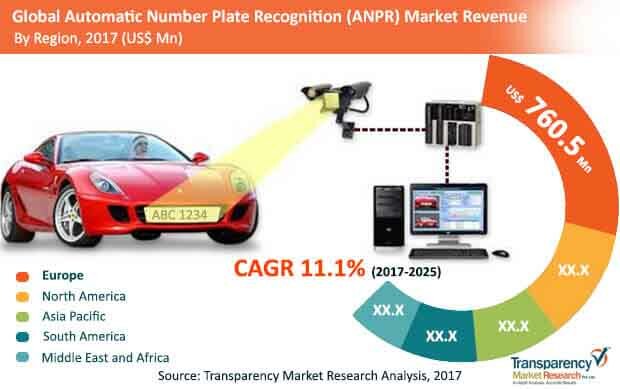 The global automatic number plate recognition (ANPR) market is segmented by application, end user, component and region. By application, ANPR market is segmented into security & surveillance, vehicle parking, traffic management, toll enforcement and others. Based on end-user, the market is categorized into government and commercial. Among these segments, government is further segmented into homeland security, traffic department, defense and others. Whereas, commercial segment is bifurcated into dedicated car parks, entertainment & recreation facilities and others. Holding over 70% of the global automatic number plate recognition market, the government sector emerged dominant in 2016. On the basis of component, the market is segmented into hardware and software. Of these, the hardware segment emerged dominant in 2016 with a share of 60% in the global market. By region, ANPR market is segmented into North America, Europe, Asia Pacific, South America and Middle East & Africa. Among these regions, Europe held the leading share of 35% in the global market in 2016. The rising adoption of ANPR hardware and software components in traffic management, toll enforcement, and security and surveillance segments is expected to create lucrative prospects for the automatic number plate recognition market in Europe. Besides this, the regional market will benefit from the rising demand for superior security involving minute scanning of vehicles. Other than Europe, North America will keep offering steady prospects for growth to the global automatic number plate recognition market. The region witnesses a high demand for technologically advanced security systems, which has created an environment supporting the market’s expansion in North America. In addition, the market will benefit from the growing demand for effective toll collection. If achieved, this will help saving time spent on long queues and eliminate expenses incurred on the same. Given the scenario, more number of ANPR cameras and frame grabbers are likely to be installed in retailing and parcel posts across the region, in turn boosting the global automatic number plate recognition market. Some of the key players in the global automatic number plate recognition market place include ARH, Inc., Bosch Security Systems, Inc., Digital Recognition Systems, Ltd., ELSAG North America LLC, Genetec, Inc., NDI Recognition Systems LLC, Q-Free ASA, Siemens AG, Vaxtor Technologies, Vigilant Solutions, and Viion Systems Inc. The key strategy used by these players to sustain in the ANPR market is to develop ANPR solutions with better reading capabilities and integrated ANPR systems. The market is highly fragmented and thus, the competition within a particular market segment such as ANPR engine manufacturing, ANPR component manufacturers and system integrators is high. In the coming few years, manufacturers are expected to expand their operations in emerging economies such as China, Philippines, Malaysia and India as the ANPR adoption in these countries is expected to swell over the forecast period. Automatic number plate recognition (ANPR) is a surveillance system with primary capability of capturing the image of vehicles and identifying their license number. ANPR systems consist of high-speed cameras with IR filters, processors capable of performing optical character recognition (OCR), application software, user interface and an alert capability to notify operators in case of a match. ANPR systems can be a standalone device or can be used with existing traffic enforcement cameras or closed-circuit televisions and are used by the police forces across the globe to prevent and detect crimes. These systems are also used for electronic toll collection on roads and for monitoring traffic activities such as red light adherence and speed enforcement. Additionally, ANPR systems can assist in the detection of stolen vehicles. The ANPR technology varies from location to location depending on the designs of number plates. ANPR systems are increasingly being adopted in traffic enforcement, detection, and prevention of crimes and access control in the public sector. Initiatives undertaken by governments to incorporate new technologies in order to ensure safety in the public sector is one of the key factors driving growth in the global automatic number plate recognition market. However, challenges related to non-uniformity in the license plate design across different states, countries, or regions are hindering the adoption of this technology. Applications of ANPR systems in the commercial sector have increased in the recent years and shown significant traction in the vehicle-parking segment. This market has been segmented based on applications, end-users and geography. Based on the end-users adoption, the market has been classified into government and commercial sectors. The government sector is further classified into homeland security, traffic department and defense, whereas the commercial end-users are classified into entertainment and recreation, and dedicated car parks. The market size and forecasts in terms of revenue (US$ Mn) for each of these segments have been provided for the period 2015 to 2025, considering 2015 and 2016 as the base years. The report also provides the compounded annual growth rate (CAGR) for each segment of the market for the forecast period 2017 to 2025. Geographically, the market for ANPR has been segmented into four regions, namely, North America, Europe, Asia-Pacific, Middle East & Africa (MEA) and Latin America. The report includes value chain analysis to recognize players in the market along with their role in the ecosystem. We have included future trends as well as opportunity analysis that will impact the demand. In addition, the report also includes porter’s five forces analysis for ANPR system. The study provides market estimation in terms of revenue and forecast for the period 2017 to 2025. Some of the key players in the global ANPR market include ARH, Inc., Bosch Security Systems, Inc., Digital Recognition Systems, Ltd., ELSAG North America LLC, Genetec, Inc., NDI Recognition Systems LLC, Q-Free ASA, Siemens AG, Vaxtor Technologies, Vigilant Solutions, and Viion Systems Inc. All these companies are profiled in a separate companies profile section of the report. This section includes details such as overview, financials, SWOT analysis, recent developments, strategy adopted by these players. Also, the report comprises market share analysis (2016) of the above companies.